Earlier topic: Is there a better way? 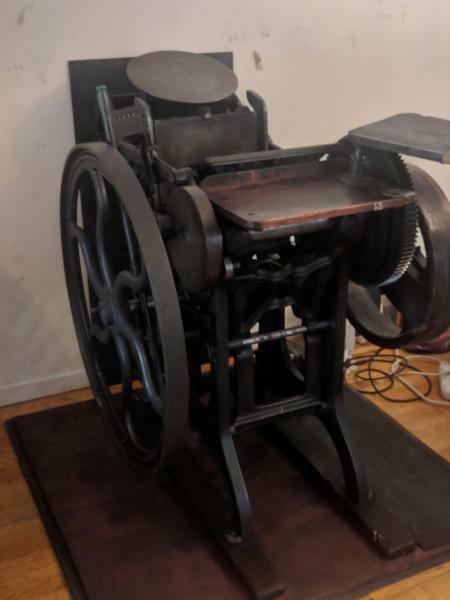 I just bought the C&P OS 8x12 from Staten Island listed in the classifieds and I will be putting it in a room with hardwood floors. 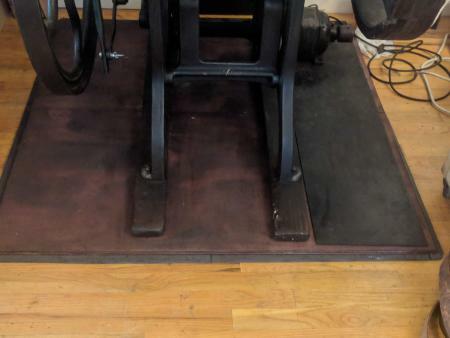 What should I put under the press to protect the floor? I have another 8x12 in my basement studio, but it’s on concrete, so I never had to deal with this kind of floor protection. Any advice is much appreciated. Thanks! I use 1/4” cork under a wood pad. Yes its bolted to the floor but you can add the undrt a 1x6 rail to protect the floor and it helps absorb the press movement. Thanks for the tip! I was wondering if I should put a whole wood plank or something like that beneath it. It’s already on some wood rails, but they’re old and beat up, so I’m going to cut and stain some new ones. I’ll look into adding the cork onto the bottoms before attaching them. I’ll definitely have to put something down to catch the oil that will inevitably drip, though. Maybe I can make due with some interlocking foam cut to fit the space. You may go to your local hvac or sheet-metal person and have them build a custom pan to put on the floor and sit your press onto that. They could put a 3/8” ridge around it to give strength and contain any loose oil? I would omit the X in the center of the sheet. Just lay it down and add the press. all that said, you may want something between the sheet metal and the floor for the floor protection. Thanks! I found one post (the only one I could find anywhere that had anything to do with this) on Ladies of Letterpress that recommended something along those lines. I’ll look around for someone in the area that can cut something like that. I was also thinking of just putting a hard rubber or cork mat beneath a plywood (or similar) board. Or maybe build some kind of platform with a few 2x10s. Do you think that would work? I just wanted to follow up on this. I ended up using two 2’ x 4’ 3/4” sanded plywood boards (to make a 4’ x 4’ area) on top of four 2’ interlocking foam tiles from Costco. I routed the edges of the plywood so they’re round, and then stained it a nice black cherry. The press was put on it this morning and looks great (though it’s not fully reassembled yet). Howdy Moe, please post a picture if possible. I’m happy to post some photos! I’ll take some when I’m done with the reassembly this week. I got it mostly back together this afternoon, so here are some photos of it on its plywood boards and interlocking foam tiles. I’m looking for a similar solution for a 10x15 (1500lbs). I was thinking of a 3/4” plywood plank with some kind of rubber pad underneath. We don’t have Costco but we used to be able to get those interlocking pads at Sears, but alas, Sears is no longer with us here. My press is already mounted to 2x10 rails. The footprint, with motor housing, is about 4’ wide by 5’ long. I really like the idea of staining the wood. Looks like fine furniture! What about oil pan? Just found something online called a PIG pallet pan which is almost big enough. It’s plastic so metal might be better for resisting solvents. Not cheap, however. The metal ones I found are upwards of 2-300 bucks. I have used the plastic chair protector sheets from IKEA- meant to go under a rolling office chair. Cheap, and easy to wipe the oil off. These are flat without the nubs for carpet use. I currently have this under my C&P directly on top of the “hardwood” (stained plywood flooring)! I chose wood over metal mainly because of the looks, though also because of the price and ease of procurement. Adding that plastic protector on top of the 3/4” wood might have been a good addition to the platform, but I only had a few days to get something down. For the stain I went with a dark cherry so when oil drips on it, it looks like a darker part of the grain after I wipe it off (and also because it contrasts with the lighter floor color). Another benefit to having the wood platform beneath it is that it spreads out the weight across a wider area. 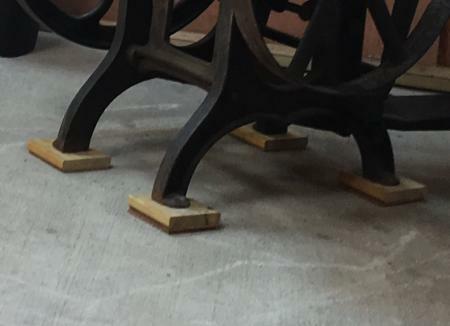 Since an 8x12 is relatively light compared to most floor model presses, this doesn’t have a huge effect, but for something like a 10x15 or larger, it might make a difference in avoiding any structural issues, particularly if you have an older house or shop. 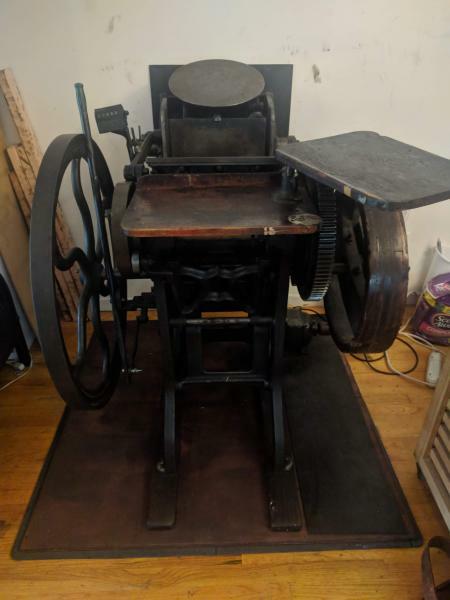 Does your press have a motor? Is it also mounted on the plywood base? I can’t tell from the photos. Thanks. There is a motor (not currently working), but I have not yet mounted it to the plywood base. After I have it repaired or replaced, I am going to mount it to a separate board, which I will screw into the plywood base.